Apparently what you find terrifying is what I find mildly arousing. I’m definitely with you on “terrifying,” Scott. This is totally spot on! 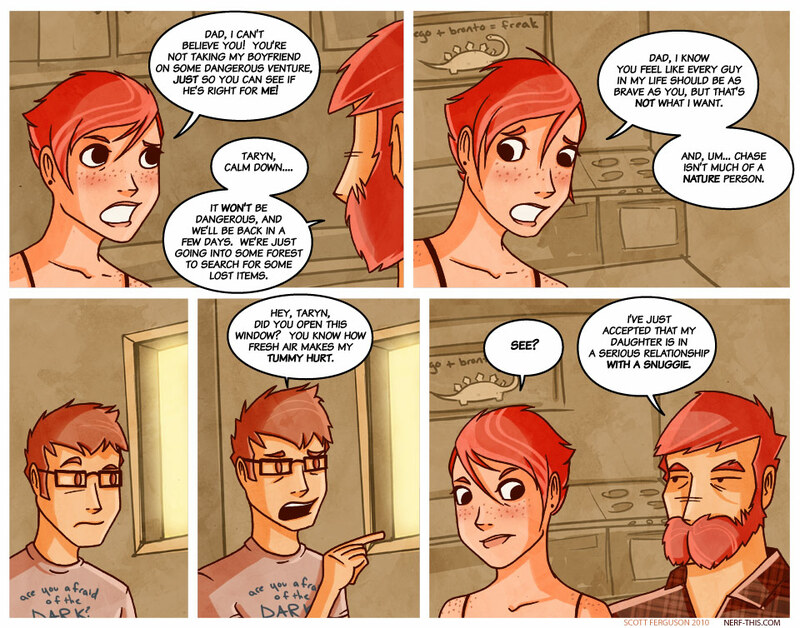 I do believe that is the greatest expression, both facial and phrase-wise, ever in the last panel. Hmm.. I think Chase’s relationship has been makin’ him kinda soft. Long gone are his glorious days of geriatric boxing, and terrorizing Stephanie. Although, I’m excited to see what this “venture” entails. That picture just terrified me beyond belief. I’ve seen something like this before, and my face made the same expression as it back then. That must be the real reason men can’t make the babies. You disturb me greatly, sir. With your scandalous links and such. As I stated to Nixion, TOTAL RECALL. One of the absolute CHEESIEST Aaahhhnoold movies. EVER. I really need to stop clicking on images described as “terrifying” and resulting in someone making a face. Especially that last image. My poor, poor retinas. After that, I am afraid of the dreams I have tonight. lol yeah that and i used to say to some coworkers. “hey now the cult can have leopard print!.” needless to say they looked at me like i had gone mad. oh and heck i wonder how monty is gonna react if he can’t go with chase onan adventure. oh god chase dressed as captain kunuckles and monty dressed as flapjack. go help me why can’t i stop seeing the horror and what the f is wrong with that kid in the snuggie pic! Not to be cliche, but “LOL” is all that comes to mind. And it appears we have the same definition of terrifying. Ah, you beat me to the Kuato reference. I love the internet. I feel Chase’s pain. Fresh air makes me feel like death. Usually during allergy season, but the last few years the allergy season seems to be all year long. apparently, I’m marrying the walking, breathing Chase. Wait. That means I’m friends with the real-life version of Chase? You don’t know how much that revelation has made my day. Now the question becomes… Where is he hiding real life Monty? That second link to the snuggie…. What’s the name of that movie with Arnold Schwarzenegger where they’re all on Mars or something and there’s all these horribly deformed people? Total Recall, I think? And there’s that dude in some lap or something who’s like a regular dude with a freaking little dude coming out of his torso? …anyway, that’s what that second snuggie link makes me think of. Kuato… or something. is the baby inside the man. Now doesn’t the mom and baby snuggie picture make you think of that? Thats actually the first thing I thought. I was all OMG! KUATO’S GRANDPA/Great Grandma! BTW, you’ve had some super great punchlines lately. I really, really, really, really hope Chase is going to somehow be this klutzy-unlucky person that somehow saves Taryn’s dad and rescues him from something dangerous in the woods, followed by accidentally discovering the lost items, and redeeming himself in his girlfriend’s father’s eyes. Then it’ll end with Taryn getting the surprise of her life when they return all chummy-buddy. But seriously, I’m just looking forward to seeing Chase thrown in nature. Perhaps there’ll be some wild killer koala bears who’ll want to exact vengeance! 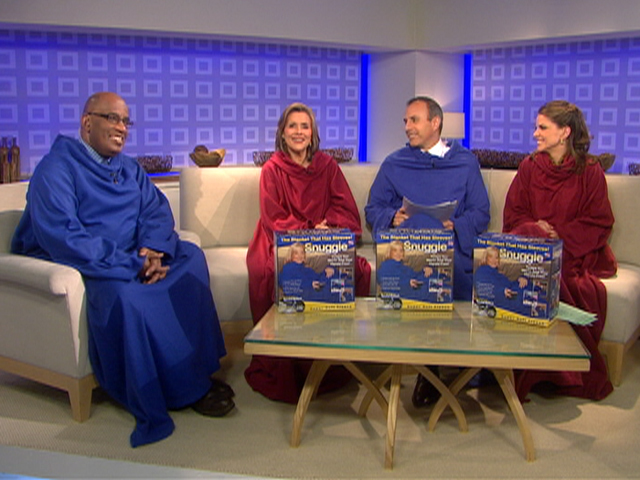 “I’ve just accepted that my daughter is in a serious relationship with a snuggie.” Perfect. I am just excited to see that Taryn’s dad is like, the POLAR opposite of Chase. What trouble is Monty getting into? Does anyone else put voices to the characters? Taryn’s dad would definitely be Sean Connery with Southern Twang. Baxter the Tortoise was John Cleese.